On 27 May 1967, Australians voted in favour of changes to the Australian Constitution to improve the services available to Indigenous Australians. The changes focused on two sections of the Constitution, which discriminated against Aborigines. The Parliament shall, subject to this Constitution, have power to make laws for the peace, order, and good government of the Commonwealth with respect to the people of any race, other than the aboriginal people in any State, for whom it is deemed necessary to make special laws. Attwood, B & Markus, A 1997, The 1967 Referendum or when Aborigines didn't get the vote, Aboriginal Studies Press, Canberra, A.C.T. The phrase ‘Aboriginal people' was probably originally included to allow Queensland to govern indigenous workers recruited from places like Melanesia to work in the sugar cane industry from as early as the 1860s. 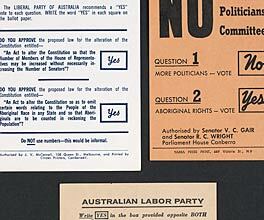 On 27 May 1967, Australians voted in favour of changes to the Australian Constitution, to improve the services available to Indigenous Australians. The changes focused on two sections of the Australian Constitution, which discriminated against Aborigines. Because this effectively made Australia's Aboriginal population invisible, the government only provided funding for the country's non-Indigenous population. This meant that states could only offer very limited services to Indigenous communities. 90.77 percent of Australians voted in favour of changing these sections of the constitution, believing that it signified the end of racial discrimination. However, in some ways the public misunderstood what they had voted for. Most Australians thought that the 1967 referendum would allow full citizenship rights for Indigenous Australians. But the referendum didn't give Aborigines the vote, equal pay or citizenship rights. It also didn't address their rates of pay or personal freedoms – issues that also needed urgent attention. Public policy changed only very slightly after the referendum, and this led to wide scale disillusionment in the Indigenous community. However, the referendum did draw attention to living standards in Aboriginal communities and allowed for more funding for states with large Indigenous populations. It was an important step forward in a battle that continues to this day.